Who are the houris mentioned in the Qur'an? Many Muslims believe they are maidens with swelling breasts to be enjoyed by martyrs in the afterlife. In a note to his fellow hijackers, September 11 ringleader Muhammad Atta reminded them of their impending "marriage in Paradise" to the 72 virgins promised in the Qur'an to the faithful departed. Islamic extremists refer to suicide bombing as a "wedding to the black-eyed in eternal Paradise." The German scholar Christoph Luxenberg says the "houris" with "swelling breasts" refers instead to "white raisins" and "juicy fruits" and are symbolic of the restoration of the lushness of Paradise. Luxenberg's research was featured in a Newsweek article titled "Challenging the Quran" on July 28, 2003. Luxenberg's findings are very relevant and convincing," says Mondher Sfar, a Tunisian specialist on the historic origins of the Qur'an. Sfar lives in exile in Paris. However, Luxenberg mistakenly argues that Arabic was not a written language until 150 years after Muhammad's death. In reality, Arabic is older than Hebrew and both languages have common roots in the Proto-Afro-Arabian languages. Aramaic reflects many of those ancient common roots. The Danish linguist Holger Pedersen (1867-1953) explained in The Discovery of Language that “Hebrew, Aramaic and Accadian languages had all undergone significant linguistic degeneration. Only Old Arabic, due to its relative isolation in the Arabian peninsula, remained closer to the old stratum of the ‘Semitic’ form of the language.” Old Arabic is sometimes called "Dedanite" because that is where the largest concentration of old Arabic scripts has been found. Further, the oldest mosques were aligned to a site in Dedan. Dedan the Elder was a grandson of Kush by his son Raamah (Gen. 10:7). Dedan the Younger was the son of Joktan, Abraham's first-born son (Gen. 25:3). Dr. Maher Hathout argues that Luxenberg is wrong. He writes, "Then he [Luxemberg] talks about 'houris,' which are allegorically symbolic beings of bliss in paradise, as being raisins and fruits. It is his prerogative but this does not provide anything supernatural to look forward to the life of eternity. It seems that what he was referring to as raisins is 'kawaib.' He challenges what he claims as the Arabic meaning of 'beings with swollen breasts,' while if he had known Arabic, he would have understood the term as 'beings of distinction.'" The Houris are Horite beings of distinction or deified ruler-priests and the number 72 further establishes the connection to the Horites. The ancient ruler-priests were aware of the precession of the equinoxes. The number 72 represents the number of years it takes for the constellations to move one degree due to precession. The Great Pyramid and Angkor Wat are nearly 72° apart, along the circle's circumference (diagram below). It has been noted also that Angkor Wat is located 72° of longitude east of the Pyramids of Giza. The name Angkor correlates with the ancient Egyptian Anhk-Hor, meaning "Long live Horus." Point A represents the Angkor Wat complex of 72 shrines and G represents the Great Pyramid of Egypt. Point I represents Har-Appa in the Indus valley. Har-Appa means "Horus is Father." Point M is the pyramid at Machupicchu with 72 steps. Point E is Easter Island. Apparently the Horites believed that each year of the precession is represented by a deified ruler and the Heavenly Council is comprised of these 72 rulers. To enter heaven is to come before this Council. "Where were you when I laid the earth’s foundation? This appears to be a reference to January 2, 2900 BC when Mercury, Venus, Mars, Jupiter, and Saturn visibly aligned within a few degrees of one another and appeared as morning "stars." This event is described from the point of reference of a surveyor at the Great Pyramid, and the Pyramid's structure serves as a memorial to this celestial event. As Bernard I. Pietsch had written, "Its shape, dimensions, and internal design communicate very specific information about where it is located on the earth and in the cosmos as well in one single moment." In ancient Egypt, the superior planets Mars, Jupiter and Saturn were associated with Horus. Mars was named "Horus of the Horizon" or "Horus the Red." Jupiter was called "Horus Who Illuminates the Two Lands" and Saturn was named "Horus, Bull of the Sky." These three planets were always depicted with the falcon-head of Horus (Krupp 1979). Messianic texts speaks of the Son of God, a title given to Horus, the archetype of Jesus the Messiah. Jesus is called the Messiah eleven times in the Qur'an. It is not a coincidence that Psalm 72 is a Messianic text. he will crush the oppressor. prosperity will abound till the moon is no more. let it thrive like the grass of the field. As many Arab Muslims and Jews have a common Horite ancestry, it seems more likely that the houris are their Horite ancestors who have entered into Paradise or the "lap of the Houris." This appears to be equivalent to the Bosom of Abraham, the Horite. This is suggested by the fact that Abraham's bosom in the Greek text is kolpos, which means lap. So righteous Arabs and righteous Jews will be in the same lap in the afterlife where they will await judgment. Jews call their ancestors "horim" and the Arab Kohanan recognize Aram, Shem and Noah as their ancestors. The Horim of Jews and Arabs are traced differently in the Torah and the Qur'an, but there are clear connections showing their common Horite ancestors. Consider ʿĀd, who according to Arab tradition was the son of Uz. Uz the Elder is mentioned in Genesis 10:23. His grandson was Uz, the son of Dishan (I Chron. 1:42). Dishan was a son of Seir the Horite and the brother-in-law of Esau the Younger. Uz the Younger was Seir's grandson. Abraham's ruler-priest caste is traced back to ancient Kush where the oldest known shrine to Horus is located at Nehken. The Horites spread their devotion to Horus, Re and Hathor across the ancient Afro-Asiatic Dominion. Horus was the archetype by which Abraham’s descendants would recognize Jesus as the Messiah and the fulfillment of the Edenic promise (Gen. 3:15). Jesus was born of Mary, a woman of the Horite bloodline. She brought forth the Seed who would crush the serpent's head and restore the faithful to Paradise, just as God promised to Abraham's ancestors in Eden. Abraham the Horite had 9 sons. The firstborn sons ruled among Abraham’s people. However the first-born sons of wives were ranked above the firstborn sons of concubines. This means that Joktan (Qahtan in Arabic) ranked over Eliezar, and Yitzak ranked over Yishmael. Joktan ruled over the southern settlements of his maternal grandfather (Dedan, Ramaah and Beersheba) and Yitzak ruled the northern settlements of his father Abraham (Hebron, Bethel and Shechem). 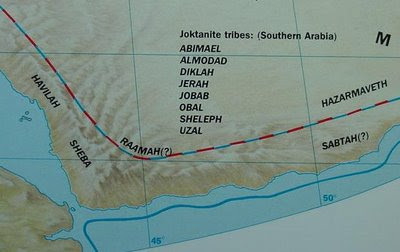 To this day the Joktanite tribes live in southern Arabia. Genesis 10: 26 tells us that Joktan had 13 sons. Almodad appears to be the first-born, as his name is listed first. If Joktan followed the pattern of his fathers, his two wives would have maintained separate households on a north-south axis. The sons of his concubines would have been sent away to the east and to the west. This may be the meaning of Gen. 10:30 which describes the Joktanite territory as extending "from Mesha [Mecca?] all the way to Sephar in the eastern mountains [Mount Zafari on the Indian Ocean?]." Some of the descendants of Joktan and Sheba hold an annual autumn feast at an oasis in the wilderness to celebrate the date harvest. This is the one time of the year that women and men may dance together. The date palm (“tamar”) is a symbol of prosperity and fertility. The ‘Id el-Tamar is a festival when the unmarried check out the pool of available matches. As is the custom from time immemorial, wife selection takes place at a well or an oasis. Abraham met Keturah at the well of Sheba (Beersheba). Moses met Zipporah at the well of her father, the priest of Midian. Midian was another of Abraham's sons, born to Abraham by his second wife Keturah. Jacob met Rebekah at a well in Padan-Aram. Some of Abraham's descendants are Jews and some are Arabs. Both Arabs and Jews have Horite ancestors because the Horite clans intermarried. Mt-DNA studies confirm that the Horite ancestors of the priests among Abraham's people did marry exclusively within the priestly lines. This is why the Kohan genetic marker is found among Arabs and Jews. Both Arabs and Jews are descendants of Ham and Shem whose lines exclusively intermarried, as did the lines of Cain and Seth before them. The distinctive Kohan DNA or "priest marker" is identifiable because Horite priests married daughters of priests who maintained flocks and herds at wells or river shrines. They selected animals for sacrifice from these flocks and herds. Joachim, the Virgin Mary's father, was a shepherd priest. RE: "The Houris are Horite beings of distinction or deified ruler-priests and the number 72 further establishes the connection to the Horites." Do you think that the 72 scribes who were chosen to translate the Septuagint, the 72 members of the ruling body of the Temple known as the Sanhedrin, the 72 elders of the synagogue, and the 72 or "The Seventy" of early Christian elders are all earthly types of the heavenly Horite order? As above, so below? There were two patients in a hospital. The bed one of them was close to the window and would love to describe what he saw outside. He would tell the other patient whose bed was away from the window that there are beautiful trees,flowers, a lake with ducks and a big garden with different fruits. The patient away from the window always wanted to see as to hat was outside. Soon the patient near the window died and on request of the other patient, he was shifted to the bed near the window. Now he could see outside but failed to see what he was told by his neighbour. all he could see was sand and rocks. He asked the nurse about his problem who told him that his neighbour "was Blind." Men like Atta and the troops of ISIS are blinded by the Evil One. The deception is great. We must pray that Christ our God banishes the demonic blindness.